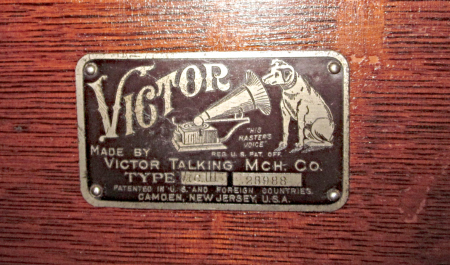 Our Victor III has a pretty oak cabinet with lustrous original finish, sturdy, reliable double-spring motor. All components are original, and the nickel-plated hardware is pretty and bright. 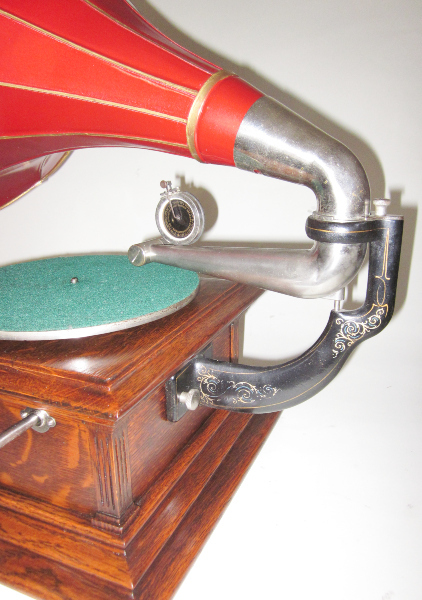 We have carefully cleaned, polished and calibrated the components to return this machine to the condition it enjoyed when it left the factory in Camden, NJ over a century ago. 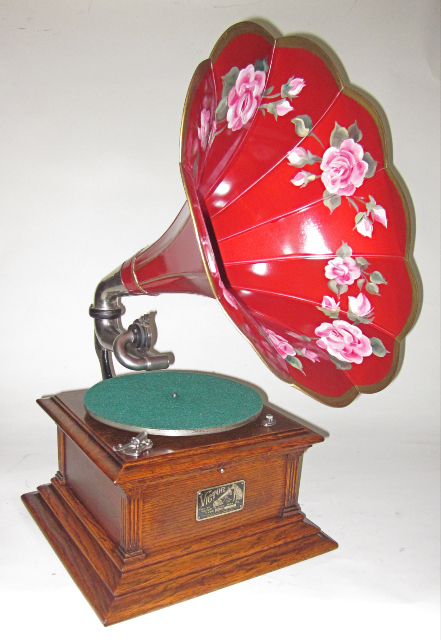 Noteworthy is the gorgeous flower horn, original factory finish -- spotlessly clean and still shiny, still shiny. Original decal on the horn! We want to draw your attention to the extraordinary condition of this machine. Not a spec of dirt, pristine, gleaming original cabinet finish. Compare this to the grimy junk find elsewhere on the Internet. 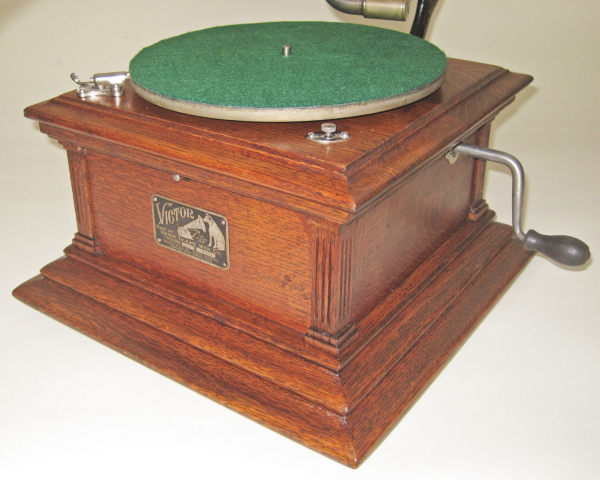 "His Master's Voice" -- and the ID plate is in perfect condition! The gold and blue filigree of the back bracket is nicely intact. Note also the rust-free condition of the original hardware. 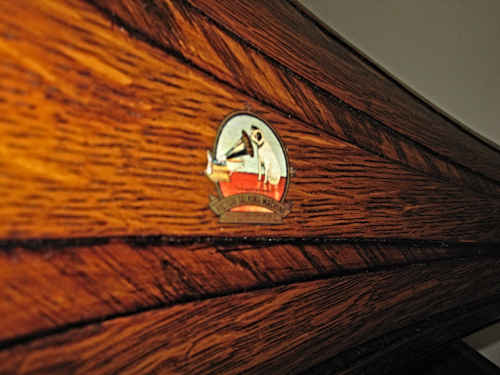 The "soundbox" -- or needlehead -- is entirely responsible for the quality of the music the III puts forth. Victor's "Exhibition" soundbox is both sensitive and sturdy. We have completely taken it apart, replaced the rubber gaskets, tuned, balanced and adjusted to give it the power to entertain you brightly, boldly, brilliantly. The mechanics are just as crisp and fresh as the cabinet. 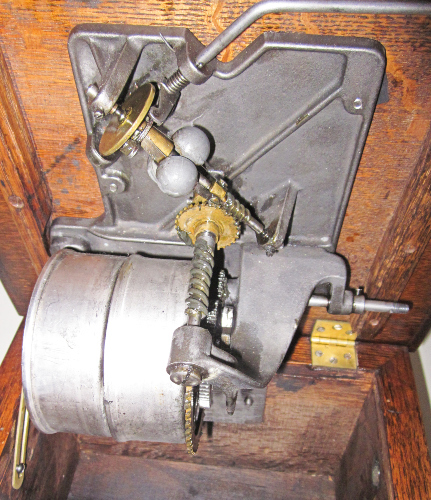 The double-spring motor -- clean, well-regulated and powerful. TWO NEW MAINSPRINGS insure power and reliability. We don't "patch" mainsprings like other dealers might -- we replace them. Why are OUR machines better than any other seller's? Because we don't "jury rig" our machines with whatever junk we have laying around the shop to get them out the door. We FIX and CORRECTLY repair any problems in the true factory manner. 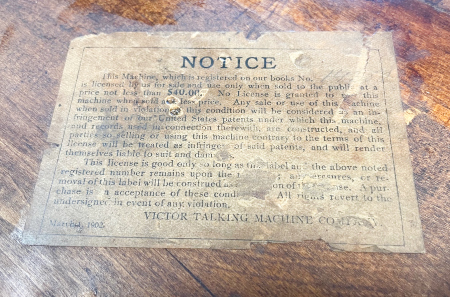 The original patent notice under the cabinet. This instrument sold for $40. -- a big chunk of change back in the day! Ladies and gentlemen, we present for your delectation the Victor "III." As always, we took the instrument down to its constituent parts and painstakingly attended to each one. Our machines are checked, tested and guaranteed to work properly. We put our 48 years of experience into each one. 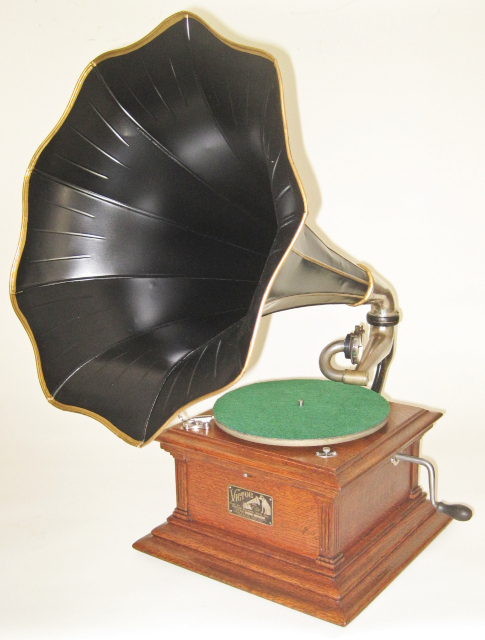 A gorgeous original factory paint horn such as this one comes along rarely, don't let this one get away! Price: $2450.00 plus s/h, (NY State residents must add tax if applicable).